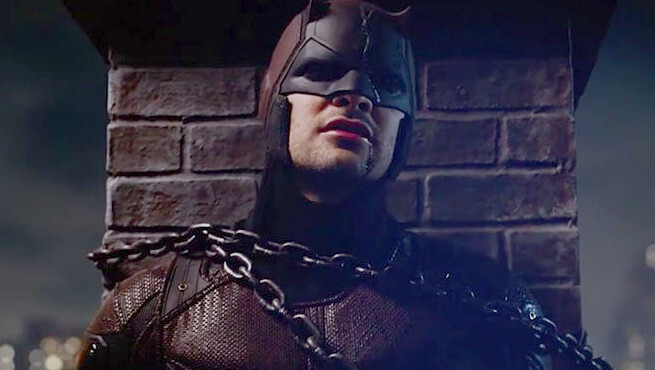 Daredevil returned to Netflix with new episodes last Friday. I may be the only writer here so far to finish the new episodes. Color me surprised. I just must have had a lot of free time this weekend. Anyway, review and SPOILERS after the cut. Season two opens with a battered, young Matt Murdock being tended to by a nun. Comics devotees will know that nun is in fact Matt’s mother. That isn’t revealed, but we move on to a more cheerful Matt Murdock doing the Daredevil thing in the shadows and seeming to enjoy himself. Of course that doesn’t last. Across town in another part of Hell’s Kitchen, a mysterious gunmen wipes out a bunch of Irish mobsters creatively called simply the Irish for the entire season. Who could it be? When a survivor goes to Nelson and Murdock for help, Matt finds himself dealing with the Punisher, and he doesn’t seem to play favorites, having hit hard against the cartels, a biker gang, the Irish, and in episode two one well-deserving child pornographer. I stated last week some trepidation over the Punisher as a character, and I stand by that analysis. Fortunately, the show did well in casting Jon Bernthal, and the script backed him up. Bernthal’s Punisher wasn’t all quiet rage and killing. He was a family man, first and foremost, and spent time in many quieter scenes giving fatherly advice to Karen Page or discussing the rights and wrongs of his methods with Daredevil (who the Punisher has nicknamed “Red”). He’s less adversarial when the series ends, and I would have rather had Frank Castle get more screen time then he did. I did not expect that to happen. That’s a testament to Bernthal. He gives a speech to a chained up Daredevil about how much he adored his daughter, and even though it ends with a cliche about the last time he saw his child alive and how he wished he done something, Bernthal really sells the regret and rage that defines the Punisher as a highly moral man who just happens to believe in lethal justice. French actress Elodie Yung also brings a good deal of fun to the role of Elektra. Yung doesn’t look the slightest bit Greek, but they do manage to explain that whole thing away. She starts off as a seductive flirt who’s really into just having fun. That fun is often a bit violent, but she still has a huge smile on her face quite a bit. Her character changes over time, as more about her is learned by both the audience and Daredevil at first, and then by herself. That actually leads into one of my problems with the season. The Hand’s mysticism may be a prominent element of the group and they have played a nasty role in Daredevil’s comics adventures, but this show did as well as it did in season one by being a somewhat straight legal drama with a vigilante hero involved. The Hand seems almost out of place and silly the more Matt, Elektra, and Stick talk about them. Matt may ultimately reject what the Hand claims about itself, but the series itself does not. That’s a shame, because much of what had gone before just got better. I know Jenny claimed Karen Page was a strong character in season one due to her gunning down Fisk’s assistant. Personally, I disagreed, seeing it as a moment of panic that made everybody’s life worse. But now Karen is the moral center of Nelson and Murdock. Deborah Ann Woll has great chemistry with Charlie Cox, much better than what Cox has with Yung (and that chemistry isn’t bad either), and Woll proved on True Blood that she can do really well with cheesy material as one of the few stand-outs in the cast towards the end of that show’s run. Likewise, the show gives Elden Henson a good showcase as Foggy Nelson, especially when Matt’s Daredevil activities cause him to miss most of the Punisher’s trial, forcing Nelson to act on his own incredibly effectively. There’s even a great return from Wilson Fisk. That is all I will say about that here. Besides the weird Hand stuff, Daredevil in its second season has one other flaw. Like Jessica Jones and a bit of season one, while the 13 episode order allows the writers and producers to give the different characters more time to develop as fully three dimensional people, it also makes me wonder if they had enough plot for the full 13 episodes. There were some truly predictable moments, like when Karen goes to the wrong man for potential information on Frank Castle while looking for the mysterious Blacksmith, and there were some dangling plot lines all over. Many were no doubt being saved for season three, with Rosario Dawson’s Claire Temple leaving to possibly move to Luke Cage’s neighborhood. The final line was something of an obvious cliffhanger, but so much was left unanswered, like what happened to those teenagers the Hand had, that I wasn’t sure if the show would ever answer them, let alone when. All things being equal, I’m giving this one a solid seven and a half out of ten Roxxon connections. I greatly enjoyed what they did, but there was a lot of stuff I think they could have done better. And can we get the Punisher on The Defenders?